You guys! It’s almost finished! 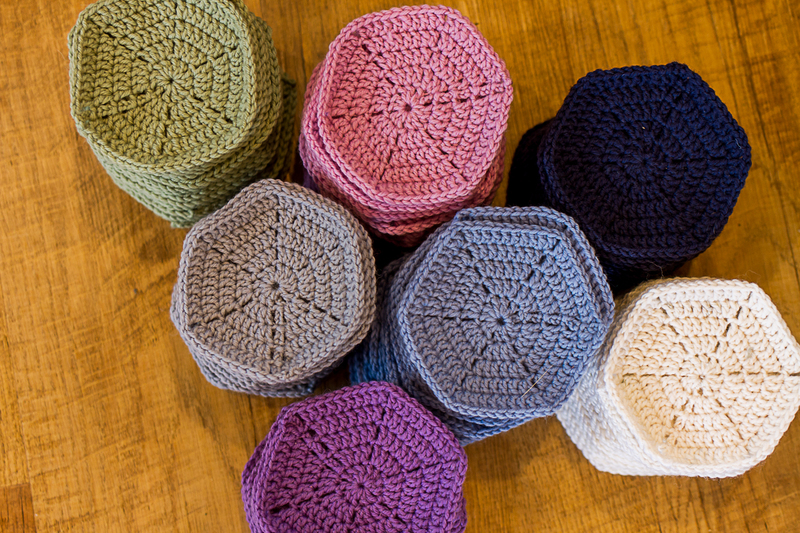 I began this hexagon rug almost as soon as we moved back to our farmhouse last July, and throughout the winter and spring, I knocked out a couple of hexagons whenever I had the chance. Last year I entered a striped afghan blanket in the local show and the year before I entered another blanket so I had hoped to enter the finished blanket into the local agricultural show in March to make it a trifecta (spoiler alert, I didn’t get it finished). True to my nature, I didn’t order enough grey to finish off the border, so I’m waiting till I get to the wool shop to pick up some more. By January I had enough hexagons to make the blanket, and I was up to the less fun part: blocking and joining the hexagons together. You can see on the photo below the difference that blocking makes to the final shape of the hexagons. Those on the left are unblocked, while those on the right are. It’s soooo much easier to join blocked hexagons together as well! 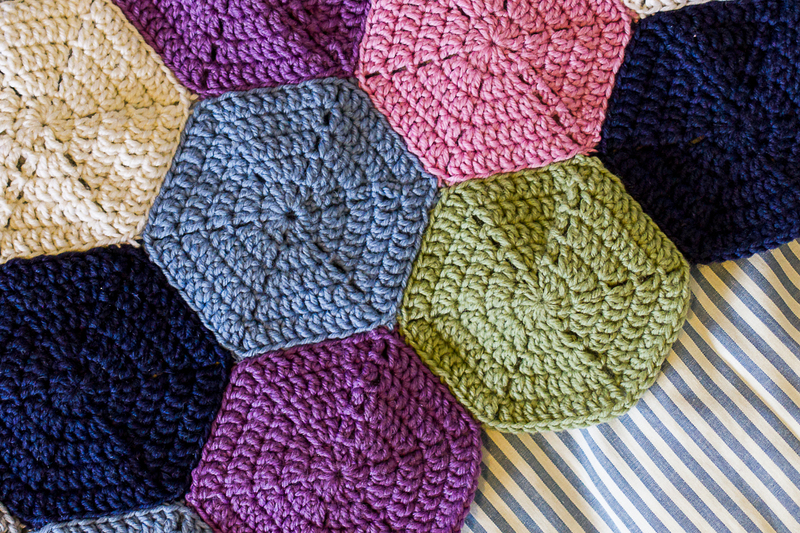 However pinning out all those hexagons was going to take a while in the limited space I had, so when I saw a clever blocking hack somewhere (cannot remember now – let me know if you have seen it before), I was ready to give it a go. Measure the diameter of your hexagons to work out what size the final hexagons should be. I added about half a centimetre to the final diameter. Using a compass, and remembering your high school geometry (who knew that would be useful?) draw a circle on to the garden kneeling pad so that the circle is the same size as the final diameter you want (remember you will need to halve the diameter and then set the compass at this width). I positioned the circle so that I could fit several on the same board. Using the same compass width, place the point on part of the circle and then draw a line where the compass swings across the circle. Then work your way around the circle to create six equally spaced points. Punch a skewer into each point. 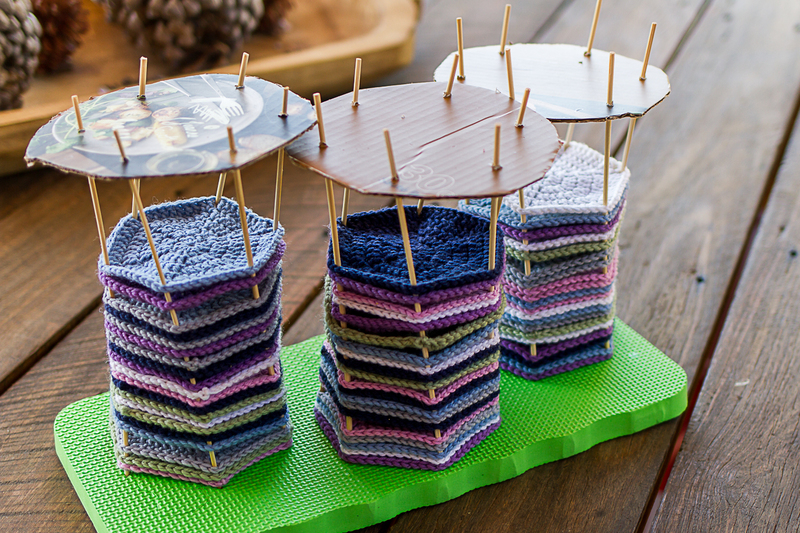 Spray each crochet hexagon with a little water to make it damp, then thread onto the skewers so that the skewer goes through the hole near each point of the hexagon. Each stack will hold about 20 hexagons. The skewers tend to bow in after a few hexagons have been threaded. I used a piece of cardboard to keep the skewers in the right spot. They do still twist slightly but the individual hexagons will still be the correct size. To make the cardboard, draw the circle and points in the same way you did on the base. Punch a hole through each point with a skewer then thread the cardboard onto the skewer frame to hold it in place. Place the board in a warm place with good ventilation to dry. I left mine overnight outdoors in a sheltered spot on our veranda. 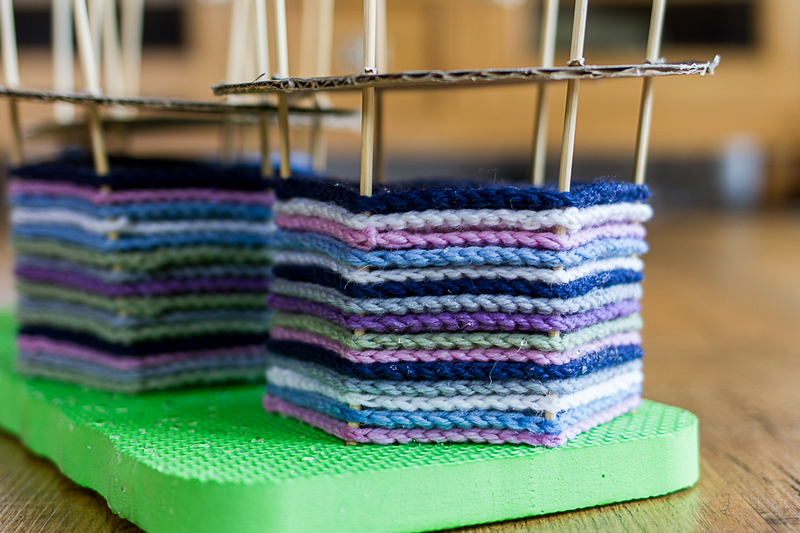 Once the hexagons are dry, pull the skewers out of the mat and the hexagons will retain their shape. Repeat the stacking and drying process until all the hexagons have been blocked. Yarn: 4 Seasons Pure Wool 100% Australian wool (we are sheep farmers here after all!!) 8 Ply in Wisteria, White, Navy, Pale Green, Grey, Denim, and Purple. Each 50g ball gave me approximately 6 hexagons on a 5mm hook. I used 4 balls of each colour. 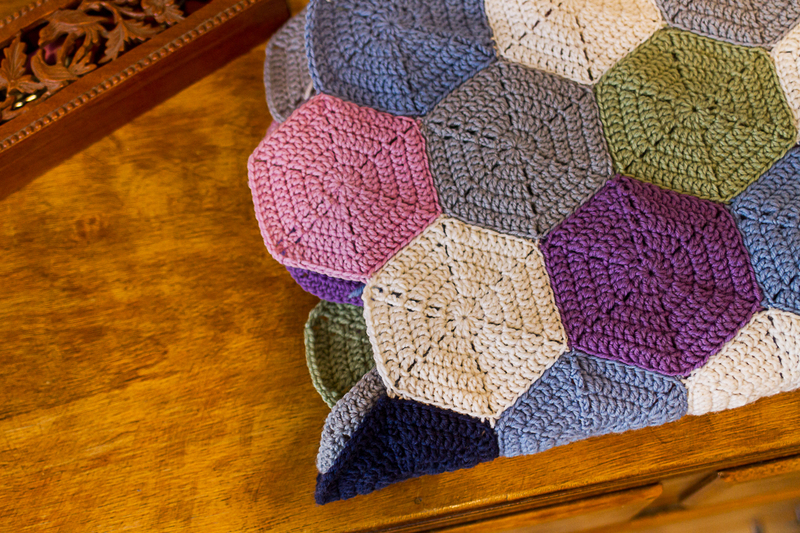 I used this youtube tutorial to make the hexagons and I joined the hexagons together with a needle and length of yarn using an invisible stitch along the back. See this youtube tutorial. If you look carefully at the photo below you may be able to see the joins, but they are hard to pick. I really like this method of joining as it is sturdy and looks good (though there is an awful lot of weaving ends in on the back). The blanket is going on the end of one of the beds in the spare room, and I’m thinking I might yet make another in the same colour scheme for the other bed, or maybe I might do something completely different. Next up is a zigzag blanket for Hannah is blues and greens as per her request, as well as some quick and easy winter beanies for the kids and myself. With winter slowly closing in, I’m looking forward to some cosy crochet by a warm fire. Thanks for sharing that blocking tip. Your blanket looks absolutely gorgeous.